Photo courtesy of county court Judge Stephen Wolaver’s Greene County Common Pleas Veterans Treatment Court and has earned final certification from Ohio. 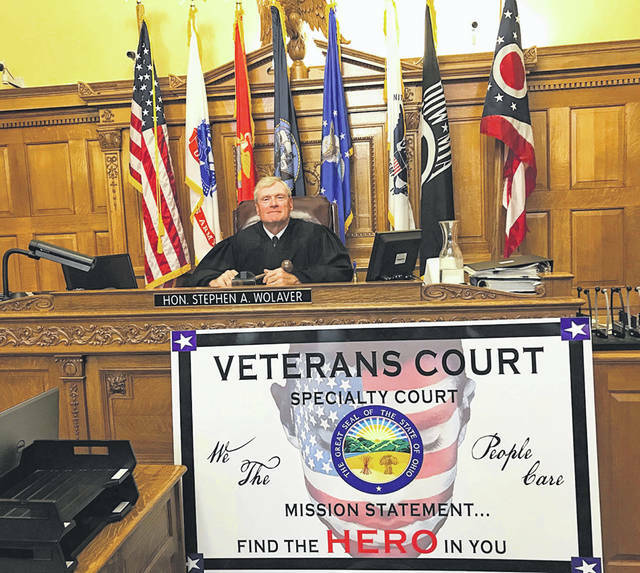 XENIA — The Greene County Common Pleas – Veterans Treatment Court has earned final certification from the Ohio Supreme Court’s Commission on Specialized Dockets. In order to receive the certification, the local court had to submit an application, undergo a site visit and provide specified program materials in response to certification standards that went in to effect January 2014. Ohio Supreme Court Chief Justice Maureen O’Connor congratulated the Greene County Common Please Court and Judge Stephen A. Wolaver for receiving the final certification. Specialized docket are courts that are dedicated to specific types of offenses or offenders and use a combination of different techniques for holding offenders accountable while also addressing the underlying causes of their behavior. There are more than 210 specialized dockets in Ohio courts that deal with issues such as drugs and alcohol, mental health, domestic violence, and human trafficking. The standards provide a minimum level of uniform practices for specialized dockets throughout Ohio and allow local courts to innovate and tailor to meet their community’s needs and resources. The certification requirements include establishing eligibility requirements, evaluating effectiveness of the specialized docket, and assembling a treatment team for implementing daily operations of the specialized docket. The team can include licensed treatment providers, law enforcement, and court personnel and is headed by the specialized docket judge. The Commission on Specialized Dockets has 22 members who advise the Supreme Court and its staff regarding the promotion of statewide rules and uniform standards concerning specialized dockets in Ohio courts. The commission makes all decisions regarding final certification. https://www.xeniagazette.com/wp-content/uploads/sites/32/2018/10/web1_Wolaver.jpgPhoto courtesy of county court Judge Stephen Wolaver’s Greene County Common Pleas Veterans Treatment Court and has earned final certification from Ohio.